Get ready to delve into the dark world of Yharnam once more in Bloodborne #1: The Death of Sleep, from Titan Comics, written by Ales Kot (Generation Gone, Zero), with art by Piotr Kowalski (Wolfenstein, Dark Souls). Based on the best selling videogame world of Bloodborne and its expansion DLC content The Old Hunters, Bloodborne #1: The Death of Sleep will mark a welcome return to Yharnam for fans of the gory, tough-as-nails game. Indeed, writer Ales Kot ensures this first issue includes all the familiar Bloodborne tropes – and then some! From the lone Hunters introduction to his initial encounters with the beastly horrors stalking Yharnam’s shadows, Kot quickly sets the scene. One particular narrative thread – the pale blood – is a mystery that was never really fully explained in videogame itself, and as such it provides a rich vein of drama for Kot to tap and facilitate key plot developments in the issue. Piotr Kowalski’s artwork brings every visceral, blood-drenched moment of Kot’s intense script to life while the gorgeous colors by Brad Simpson adds vivid clarity to the flesh-rending carnage. If you’ve played the game, you’ll know how hideous and grotesque the monsters in Bloodborne are, and Kowalski’s art impressively recreates the distinctive look and feel of these monstrous creatures. As you’d expect, the action is slick and brutal too, and like the games unforgiving nature that all-too familiar “You Died” moment is something that surprisingly feels almost serene here – rather than the almost throwing the controller across the room rage that the Bloodborne game often made you feel when your Hunter met a grisly end. While obviously aimed at fans of the Bloodborne game, there’s plenty of mystery and terror for horror fans to enjoy as well without any prior knowledge of the game. Boasting a striking cover by Jeff Stokley, along with a choice of three variant covers, the strong story and impressive art in Bloodborne #1 gets this new Titan Comics book off to a great start and I’m eager to see where the Hunter’s quest takes him next. Writer: Ales Kot / Art: Piotr Kowalski. Cover: A Jeff Stokley, Cover B: Game Cover, Cover C: Potr Kowalski & Brad Simpson, Cover D: Andre Lima Arujo & Chris O’Halloran. It sounds interesting, but I think I’ll wait for the trade on this one if I decide to pick it up. Its a good new title from Titan, especially for those who enjoyed the Bloodborne game. The story in the comic brings a new slant on things, and the art is very good as well. Well worth checking out. Glad to see you seem to be feeling well enough to write reviews again. I’ve never played Bloodborne, but it’s a game that I’m interested in checking out some day. Of course I’m behind as it is. Only just picked up Uncharted: Lost Legacy and I’m not sure when I’ll actually be able to play it. That is some cover art! Sure is, really captures the haunting and gruesome world of Bloodborne perfectly. Oh, yes, Outlast is a creepy game! Bloodborne is quite an intense game as well the comic brings a new slant on it, and sets up an interesting quest-like storyline. The old Silent Hill video games always used to creep me out, the storylines and monsters in those games were so eerie. Oh yes! The Silent Hill games were very creepy… but they were weighed by the puzzles and, at the time, nothing was so scary that it could keep me from puzzles XD Throw a few monsters with a penchant for evisceration into Myst and I don’t think I’d have been phased! Yeah, Silent Hill had some weird puzzles and even stranger monsters at times. Always spooked me when the radio started to crackle and you knew a monster was near. Extremely huge fan of the whole Demon’s Souls and Dark Souls series, as well as Bloodborne. I got to admit that the story in Bloodborne however went through one ear and exited the other. I never thought the story was the real focus of the game, and was actually just world-building stuff that put context to everything you ran into hahah It’s nice to hear the new comic series is actually quite interesting though! I might give it a shot at some point when it gets collected into a paperback. Nice review again sir! I like it when we get these tie ins to games, I’m not in to Bloodborne personally but I know that Titan Comics have done a good job with their Assassins Creed titles. Great review Paul! What do they mean: “don’t judge a book by its cover”?! 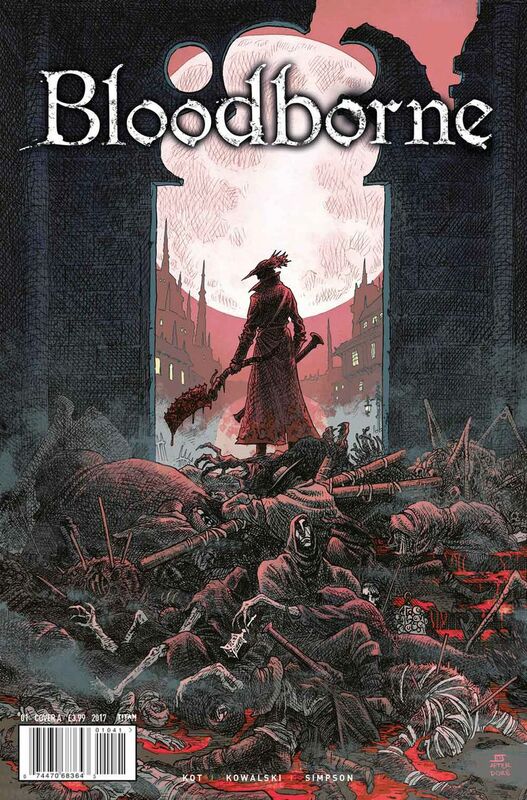 Yep, sure is a great cover for this first issue of the Bloodborne comic sereis. Captures the tone of the game perfectly!